Have you ever wanted to see how McGill works behind the scenes? Are you passionate about campus issues like student services, academic programs, or equity? Do you have a great idea to improve student life? Then apply to sit as a student representative on a university committee! This is your opportunity to get involved on campus and work with the McGill administration and SSMU. Apply by Monday, April 17th at 5:00pm. We are preparing to train the incoming executive team in May! Spring is (technically) almost here! We hope that the longer daytime hours are helping you make it through that midterm-paper grind. Just a reminder that we’re currently hiring for a University Affairs Secretary General and two Equity Commissioners. Apply by March 31st! SSMU is hiring for 2017-2018! Work under the University Affairs portfolio or in another area at SSMU. Available positions include University Affairs Secretary General, Equity Commissioner, and much more. The deadline to apply is March 31, 2017. Contact SSMU Human Resources with your questions or visit recruitment drop-in hours between 11am-4pm every Monday and Wednesday in March. SSMU University Affairs has released a new research report, entitled Fostering Post-Secondary Success: Support Programming for Students from Foster Care. This document examines current issues faced by students from the welfare system and their transition to post-secondary education, as well as targeted recruitment, retention, and support strategies in place at other institutions. A survey of student experiences and existing programming indicates that McGill University provides no dedicated support resources for this population, nor do they currently collect relevant demographic data beyond some financial aid applications. The report makes clear that much more can be done to promote educational access and success for students from foster care entering McGill. Proposed recommendations include developing dedicated financial aid opportunities; conducting targeted outreach and recruitment campaigns; creating specific student mentorship and psychological support programs; and collecting comprehensive data on student admissions and experiences. Any questions regarding the report can be directed to the VP University Affairs. Despite being the shortest month, February sure has been hectic! Reading Week is close, so let’s push through this last week until the break. In the meantime, check out my February 23rd Report to the Legislative Council for all of the updates. 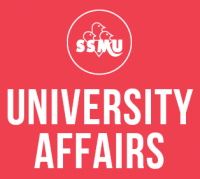 SSMU Executive nominations are now open! Find more information on requirements and the nominations process here. Check out our February 9th Report to the Legislative Council to learn more about the busy upcoming month of advocacy projects. Open Educational Resources Researcher is presenting at Legislative Council meeting this week! SSMU University Affairs has released a new research report, entitled Striving to Place: The First Generation Student Experience at McGill University. This document examines current issues faced by first generation students at McGill as well as targeted recruitment, retention, and support strategies in place at other institutions. A survey of student experiences and existing programming indicates that McGill University provides no dedicated support resources for this population, nor do they currently collect relevant demographic data beyond financial aid applications. The report makes clear that much more can be done to promote educational access and success for first generation students at McGill. Proposed recommendations include developing dedicated financial aid opportunities; conducting targeted outreach and recruitment; creating specific student mentorship and psychoeducational initiatives; and collecting comprehensive data on student admissions and experiences. Any questions regarding the report can be directed to the VP University Affairs. Think you could be the next VP University Affairs? This is your chance! Executive nominations open on Monday, January 30th, and we’re hosting a SSMU Executive Info Session for you to learn more about the role. In addition, you can now sign up for our “A Day in the Life” shadowing program in order to spend a day (or an afternoon) with any Executive and see what their job really entails. Finally, as always, you can check out my bi-weekly Report to the Legislative Council for the latest updates on UA projects & responsibilities. Happy New Year and welcome to the Winter term! I hope that you enjoyed your holiday break and are feeling refreshed. This week, we’re running our semesterly “Know Your Rights” campaign to inform students of their academic rights at McGill. You can check out our website and Facebook event to learn more. In addition, if you’re interested in learning more about the role of a student senator and/or SSMU Executive, we’ll be hosting info sessions on both topics later this month! The Student Senator Info Session will be on Monday, January 23rd from 5:30-6:30pm and will feature a presentation on university governance, the senator role, and perspectives from your 2016-2017 senators. Hired Harmful Military Technology Researcher to begin work this term. Check out our January 12th Council report to learn more about plans for the Winter term. How is it almost December already? Procrastinate from your exam studying by reading our December 1st Council Report to learn where planned projects have landed this term! Stay tuned for a January progress report along with revised goals for the Winter 2017 term. We are recruiting volunteers for the January Know Your Rights campaign; sign up by December 9th! We are recruiting for a new Harmful Military Technology Researcher; apply by December 8th!